A stripped exhaust stud and blown exhaust manifold gasket put an end to my weekend after one timed run. It was still a good day’s racing with probably a little too much sideways action. Here’s hoping we can resolve the issues before the next race at either Kames or Fintry. Thanks to all the Marshalls for staying out so long, and to Lothian Car Club for hosting the event. When we arrived and setup at Doune early on Saturday morning it was a particularly misty morning. I only managed to walk half the track before the drivers briefing, but it was clear the track was partcularly green and slippy, having endured a particularly hard Scottish winter. The first practice wasn’t too bad, and although uneventful and I thought pretty slow, it was actually pretty quick looking at the other times, and in actual fact would be my fastest time of the weekend. Upon returning to the paddock after first practice I popped open the bonnet to inspect the engine which had started to develop a noise resembling a tractor. I was disappointed to find a very distinct blow in the exhaust manifold where it meets the head. I thought it best ot try and retighten the nut whilst still hot and although I got most of them tight (some were finger tight! ), one nut decided to strip itself and the stud. The mechanic managed to retap the broken stud, but only from 8mm down to 7mm. We scoured the paddock for a 7mm nut, but all we could find were 6s and 8s. So for the first timed run it was decided to run with the die tap itself in place to try and hold the manifld on a bit better. After sitting on the line wiating to go for my next run, the hooter sounded and the red flag came out in what would be the first of two big incidents on the hill. 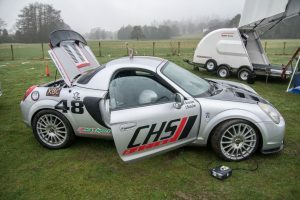 An Mx5 had left the track at Oak tree and all we knew was the driver was unconcious and they were securing the car before taking him out the car. Thankfully, although taken to hospital he only suffered concussion and a few broken ribs. This put an end to the day’s practice and we stopped for lunch and went straight into the timed runs after lunch. 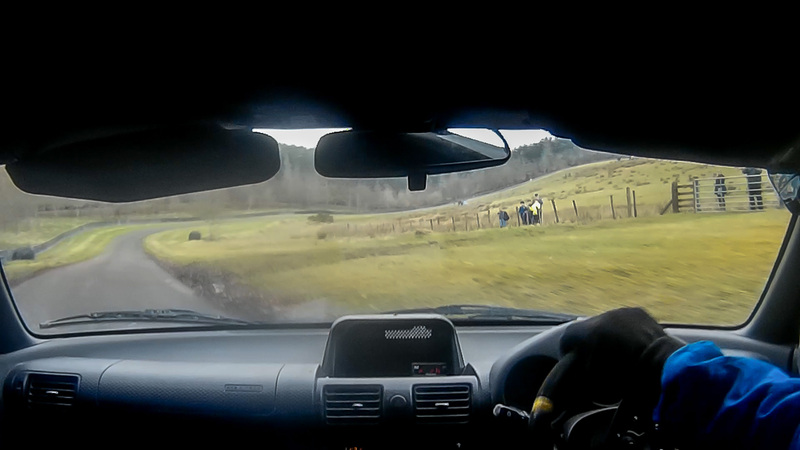 Mr Locke had warned me after his first timed run that Junction into the Meadow was very slippy, and I’m glad I had that in the back of my mind as I lost the back end at that very point on my timed run. However, unlike Mr Locke, I did manage to catch the slide as you can see in the video below. I did enough to get points on the board and after some deliberation it was thought best to retire for the weekend and fix the car properly rather than make things worse by doing more runs. 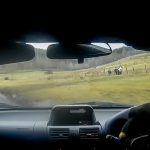 ← Doune – King of the Hills?